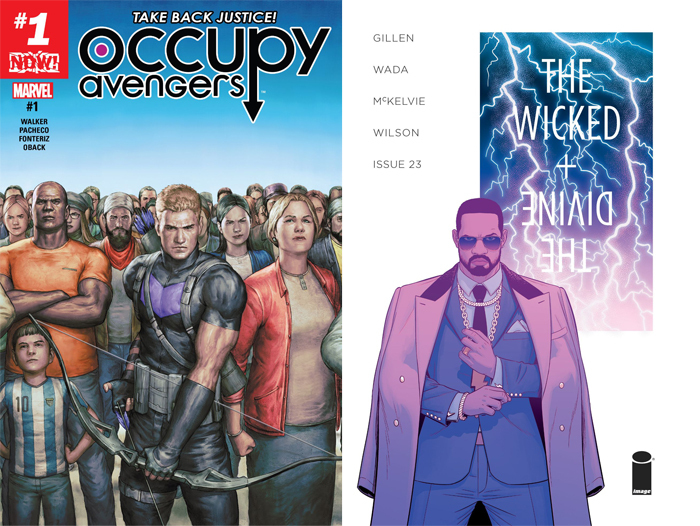 Home »Comics»Deadshirt is Reading: Occupy Avengers and The Wicked + The Divine! Deadshirt is Reading: Occupy Avengers and The Wicked + The Divine! Occupy Avengers, awkward and cringe-inducing name aside, posits an interesting premise: The regular Avengers fight cosmic threats and supervillain masterminds, but who fights the problems that can’t be punched out? I’d have doubts if this were a Bendis or a Waid title, but David Walker proved on books like Power Man and Iron Fist and the unjustly cancelled Nighthawk that he can tell superhero stories with relevant commentary about real institutional injustices. This first issue is an uneasy but intriguing start of Green Arrow Hawkeye’s Hard Travelin’ journey across The Real America. Walker and Pacheco throw Hawkeye, nursing some debilitating guilt over his role in the death of Bruce Banner in Civil War II, into a Law & Order-style ripped from the headlines mystery involving a Native American reservation’s poisoned water supply and some Blackwater-looking goons. Walker’s characterization of Clint Barton as the human conscience of the Avengers who’s been there, done that is strong and gives the book some crucial levity. I’m not quite as sold on the book’s interpretation of Red Wolf, who doesn’t get too much to do in this issue beyond provide exposition and call Hawkeye out on his liberal cluelessness. While I would’ve liked to see Marvel try a more unconventional artist on Occupy Avengers, Pacheco’s an old hand at superhero comics, and his action pages here really pop (especially in the big fight sequence that takes up the last third of the issue). The dilemma presented by Occupy Avengers — can superheroes in the Marvel Universe fight “real” issues — is really going to make or break it as a book. A Marvel comic that tackles water contamination and the inhuman living conditions forced on Native Americans is a good thing! Bu the issue’s last page reveal of the supervillain behind these real world problems, while an admittedly pretty clever use of a C-list character, has me worried that this creative team is going to turn in a pretty bog standard superhero team up. But if any writer can deliver on a premise like this, it’s Walker. The last issue of The Wicked + The Divine ended with a big, bloody question mark, as the pantheon had to face an uncertain future following the death of their mentor/murderer Ananke. Hints at the new status quo are scattered throughout issue #23, the beginning of the ominously titled “Imperial Phase” arc, but you’ll have to search for them, as this is no ordinary issue. Instead of a standard comic book, WicDiv #23 is presented like an issue of Pantheon Monthly, an in-universe magazine of the gods. For this experimental chapter, real journalists from The Guardian, Wired, and other publications interview several of the gods–with answers supplied by Kieron Gillen, in-character(s). What makes this special issue truly wonderful to behold is the interior artwork by Kevin Wada. Known for his cover art and fashion-forward redesigns of comic book heroes, this is Wada’s first time supplying interior art for a comic, and he’s a perfect fit for the world of WicDiv. His watercolor fashion spreads are delicate, gorgeous, and sensual, full of fantastic little details like Baphomet’s shirtless selfie taped to The Morrigan’s mirror. If Pantheon Monthly were a real magazine, I know starry-eyed teenagers would be tearing it apart to pin their favorite godly glamor shots on their bedroom walls. The text of the issue itself is meaty and dense, and shouldn’t be skimmed. The guest writers are all excellent at establishing mood and tone (I was especially fond of Leigh Alexander’s interview with The Morrigan, and the “lost” Lucifer piece), and the different authorial voices are refreshingly authentic. The weakest contributions to the issue, strangely enough, come from series co-creator Kieron Gillen; the conversations with the gods rarely reveal anything new. Baal seems proud, but is motivated by his strong sense of personal responsibility. Woden is sexist, racist, and, sigh, “problematic.” Amaterasu remains sunnily optimistic in the face of her own mortality. Yes, we know all these things, can we dig deeper? Interviewing a god is a killer concept, but the answers left me wanting. (Also, considering Urdr/Cassandra was a journalist before she became a god, her absence from this issue feels like a missed opportunity.) The Wicked + The Divine #23 is a beautiful experiment that begs to be looked at, poured over, and savored. Still, a tiny voice in the back of my mind wonders if this is, for lack of a better term, killing time until the bodies start to fall. ← Previous Previous post: Deadshirt is Watching: Westworld and You’re the Worst!